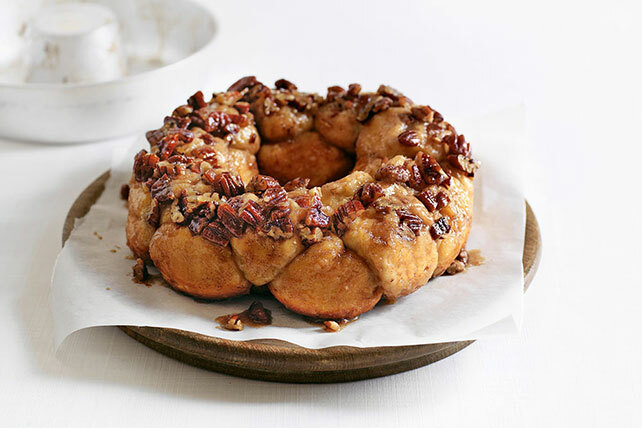 Hints of maple syrup and cinnamon lead you to the creamy cream cheese centers of these decadent sticky buns. Fun to pull apart and eat, these are sure to be a huge hit! Melt remaining butter. Mix sugar and cinnamon in shallow dish. Separate dough into 20 biscuits; flatten each to 1/4-inch thickness. Roll cream cheese cubes in cinnamon sugar until evenly coated; place 1 on center of each biscuit. Gather up sides of dough to enclose filling; press edges together to seal. Roll each into ball; dip top in remaining butter, then in remaining cinnamon sugar. Arrange half the balls, cinnamon sugar-sides up, in prepared pan. Repeat with remaining balls to form second layer. Top with any remaining butter and cinnamon sugar. Bake 30 min. or until golden brown. Cool buns in pan 1 min. ; invert onto serving plate. Remove pan. Top buns with any remaining nuts in pan; cool slightly. Since these tasty buns serve 20, they make a great addition to your next brunch. And their built-in portion control makes them extra convenient. Wrap leftover buns in foil, then refrigerate to enjoy the next day.